Re: Had Enough Crime Yet, America? "Apparently, America has not had enough of crime yet!" Bradlee Dean, once again, misses the point. I is because I have had enough crime, enough murder of innocent people by prosecutors, DNA analysts faking DNA tests, etc. that I am against the death penalty. 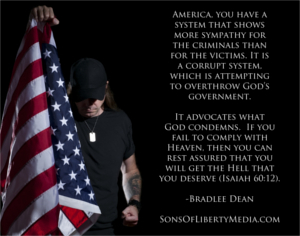 Bradlee Dean thinks just because I am against the death penalty, because it is used to silence innocent victims of the state, that I am in favor of crime. What a twisted mentality Bradlee Dean has. Further, Bradlee Dean, whose articles are usually peppered with an abundance of Christian scriptures, is showing the true nature of his Christian love. Have you compared the recidivism rates of the US against Iceland, or Norway?